Writer: Edward T. Lowe Jr. Plot: Count Dracula (John Carradine) approaches a scientist, Dr. Franz Edelmann (Onslow Stevens), and asks him to discover a cure for his immortal curse. Edelmann and his hunchbacked assistant, Nina (Jane Adams) study Dracula’s blood and discover an unknown parasite. As Edelmann begins his experiments on Dracula a new patient arrives – Lawrence Talbot (Lon Chaney Jr.), who seeks a cure for his own curse. When told the doctor is unavailable, an upset Talbot flees to the police station and demands to be locked up. The police summon Edelmann to examine him, and he arrives just in time to witness the rising full moon and Talbot’s transformation into the Wolfman. Edelmann believes he can cultivate a mold that will allow him to reshape Talbot’s skull, which will relieve the pressure on his cranium and prevent his transformation. (It doesn’t make a lot of sense in the context of the movie either.) Unwilling to wait for enough mold to be cultivated, Talbot flings himself from a nearby cliff. That night, as Edelmann searches for Talbot, the Wolfman attacks him. Talbot changes back before Edelmann can die, and the doctor discovers he’s hiding in a cave perfectly suited to grow the spores he needs. As they search the cavern, they find something totally unexpected: the Frankenstein monster (Glenn Strange). Because what the hell. They bring the monster to the hospital, hook him up to machines that can bring him back to life, then decide not to do it. This should end well. Dracula, remembering that his name is in the title of the movie, stops by and sees Edelmann’s assistant Miliza (Martha O’Driscoll) playing the piano. For no discernible reason, he uses his power to mesmerize her. Wary, Edelmann tells Dracula he will require another transfusion to test his theory, and Dracula agrees. Edleman falls asleep during the experiment, though, and Dracula reverses the transfusion, placing his own blood into the doctor’s veins before fleeing. Edelmann follows Dracula to his coffin, which he drags into the sunlight and opens, reducing the vampire to a skeleton and laughing at the fact that there’s still a third of the movie left to go. The transfusion begins to affect Edelmann, darkening his eyes, causing his reflection to vanish. He is becoming a vampire. This conveniently leads to him having a dream sequence largely made up of clips of earlier Frankenstein movies, which tempts him to resurrect the monster. The good in him forces back the evil, and he decides to use the spores to operate on Nina while he’s still himself. She convinces him to use his time to operate on Talbot instead, and he does so, knowing it will not be until the next full moon that they can be certain he was successful. Edelmann, meanwhile, begins to succumb to the vampire, killing a villager and fleeing the same crowd of angry townspeople who spent most of the 1930s and 40s waiting for Universal to make another monster movie so they could find work. The police come to Edelmann’s hospital, believing Talbot responsible for the murder. Talbot realizes Edelmann is the real killer, and he pledges to help him stay sane long enough to help Nina, then destroy the evil within him. As the next full moon approaches, Talbot is astonished to find he does not transform: the operation was a success. The Wolfman is no more. As Nina tries to tell Edelmann, she finds him resurrecting the Frankenstein Monster, having given in to the evil within him. He kills Nina and has the monster attack the police. Talbot retrieves a police weapon and guns down Edelmann as the mob arrives for their scheduled appointment. The lab catches on fire, because 1945, and the monster is destroyed as the mob, Talbot and Milizia flee. Thoughts: By 1945 the Universal Monster franchise had largely evolved into a bizarre mishmash where the monsters – particularly the three heavyweights – appeared in each other’s films indiscriminately and with little to no regard to continuity. Just the year before, in House of Frankenstein, audiences saw Dracula, the Wolfman and Frankenstein’s monster each meet their demise, but here they are without any attempt at an explanation. Today we’d just call it a “reboot” and pretend the earlier movies never happened, but nobody wants to ignore the Universal Classics… nobody in their right mind, anyway. If there’s one thing this movie proves, it’s that trying to come up with a scientific explanation for what has always been supernatural in-canon is usually a bad idea. The parasites in Dracula’s blood are bad enough, but the explanation for Larry Talbot’s transformation Wolfman is close enough to “it’s all in your head” as to almost be insulting to fans of the character. One can easily believe George Lucas watched this movie just before he whipped up the concept of Midi-Chlorians. The good news is, no matter how crappy the plot of a movie, it was always a treat to watch Lon Chaney Jr. and Glenn Strange in their legendary forms. Chaney’s Wolfman has always been the saddest and most tragic of the Universal monsters, a creature that wishes for nothing but peace but is utterly unable to find it. When Stan Lee created the Hulk, he always credited inspiration coming from Dr. Jekyll and Mr. Hyde, but I’ve often thought the sad case of Bruce Banner had more in common with Lawrence Talbot. And with that in mind, it’s nice to see him sort of get a happy ending for a change. Sure, by the time he met Abbott and Costello three years later he was the Wolfman again, but so what? Frankenstein wasn’t burned anymore and Dracula had regenerated from a skeleton back into Bela Lugosi somehow. Who cares? It’s the 40’s! Party! Anyway, on to Dracula himself. John Carradine as the legendary nosferatu has surprisingly little to do in this movie, even though he’s the title character. (In truth, at this point Universal’s naming convention was practically random: grab the name of any monster that appears in the movie and add a few other words. 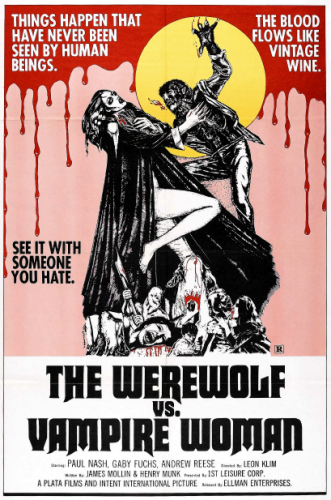 This film could just as easily have been titled Curse of the Wolfman or Return of Frankenstein or Dr. Edelmann’s Wonder Emporium and it would have been equally – if not more – accurate.) 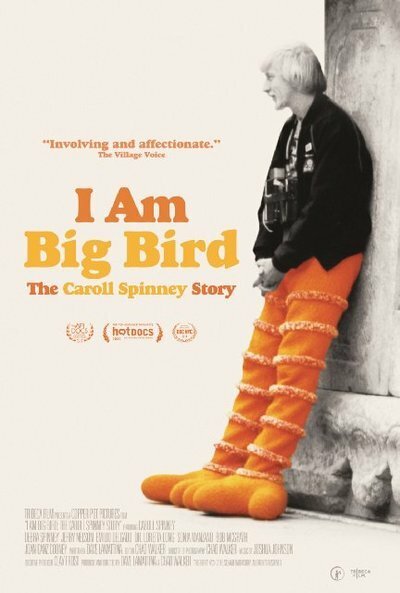 To Carradine’s credit, in the time he’s on screen he puts forth a solid performance. There’s a charm and a menace to him, and one can believe a woman would allow herself to be in his presence long enough to be affected by his hypnotic powers, which is convenient, because that’s exactly what the alleged plot calls for. The real star of this movie is Onslow Stevens as Dr. Edelmann, who starts out as a well-meaning scientist skeptic before becoming a creature of cartoonish evil. The dream sequence he has is nearly laughable, as his “good” and “evil” selves seem to argue over whether or not to resurrect the Frankenstein Monster… as if there could be any doubt that he would. Stevens does a great job with what he’s given, he’s just not given A material. This is not a very good movie, to be blunt. But even the worst of the Universal Monster pictures had a strange sort of charm to them… the fun of seeing these characters overcame the cheesy effects or the ludicrous storylines. While this should never be anyone’s first choice of a monster movie to watch, if it’s available or if you’re doing a marathon of the classics, it has its place. Welcome to the first installment in Crappy Movie Roulette! As you guys may have noticed, I watch a lot of movies. And I own a lot of movies. If video stores were still a thing, I certainly have enough inventory to open one on my own. And I’ve got your local Redbox beat for selection hands-down. But neither of these should be mistaken as a statement that I’ve watched every movie I own. Truth be told, I haven’t, and the big culprit in this are multi-packs. You know the ones I’m talking about — the ones that package together four, eight, ten, even fifty movies in a single DVD set for a low, low price. Now this low, low price often is accompanied by low, low quality, but because you can often get these packs for as little as five dollars, if there’s even one movie in the set I like, I’ll bite, because I would have paid five bucks for that movie alone, and now I’ve got a bunch more. It’s the collector’s mentality, I know. When I die, you’ll be able to commission a very bored artist to create a 20-foot statue of me out of my DVDs. Anyway, the movies in these packs are frequently of the caliber we call… oh… bad. Otherwise they wouldn’t be selling them fifty to a pack. But there’s also a real charm to be had in bad movies sometimes… sometimes. Not all the time. That in mind, I’m here to institute a new irregular feature here at Reel to Reel: Crappy Movie Roulette. Every so often (I’m not going to marry myself to a regular schedule here, it’ll happen whenever I feel like it) I’ll choose five movies from my vast collection of crappy movies that I think might be fun to watch. It won’t necessarily be random — in fact, two of the choices this week are favorites of the Flop House Podcast‘s Stuart Wellington, which is how they got on the list. I’ll give you guys the IMDB synopsis of each of my five choices and let you vote, then sometime soon (probably next week) I’ll watch the winner and write up a Gut Reaction review. Sound like fun? Starring Kelli Maroney, Tony O’Dell, Russell Todd, Karrie Emerson & Barbara Crampton. 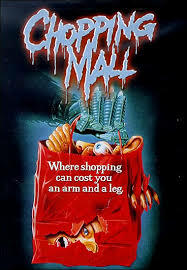 Synopsis: Eight teenagers are trapped after hours in a high tech shopping mall and pursued by three murderous security robots out of control. Why you should vote for it: Again, remember, I have never seen any of these movies. But between the synopsis and the poster, this sounds like insane 80s slasher excess at its best. Murderous security robots, people. Murderous. Security. Robots. Starring Kunihiko Mitamura, Yoshiko Tanaka, Masanobu Takashima, Kôji Takahashi, Tôru Minegishi. 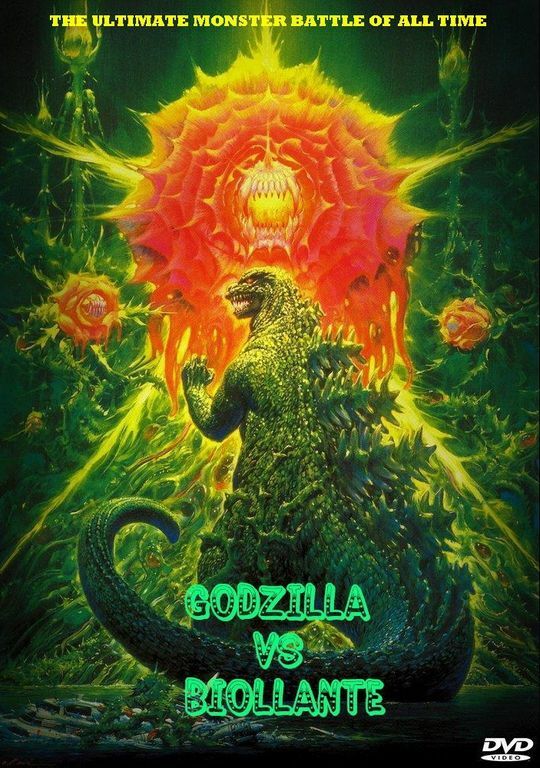 Synopsis: After rising from his volcanic grave, Godzilla is threatened by a mutated rosebush. Why you should vote for it: Because obviously, the natural progression for threats to the greatest giant monster of them all is “space turtle,” “robot duplicate,” “rosebush.” Also, it still can’t be worse than than the Matthew Broderick movie. 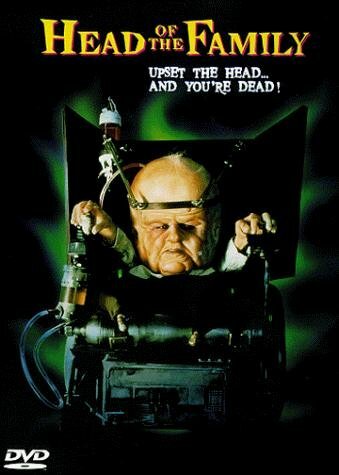 Synopsis: The “head” of the family is literally that–a giant head on a tiny body, who psychically controls the rest of his even weirder family. Why you should vote for it: Look at that lil’ guy. Look at that lil’ guy with the great big head. Idn’t he CUTE? Synopsis: A budding young scientist lad is caught by his mom checking out the lady across the way with his telescope, whereupon she lectures him on the evils of women. Twenty years later and all grown up, the scientist announces his theories of invisibility, and his colleagues laugh, to which he responds by killing four of them. He escapes from the loony bin and gets a job teaching summer school physics at a high school. The students decide to tease him about the same time as he perfects his invisible juice, and he goes on a spree of vengeance. Why you should vote for it: I don’t even know what else I need to say. I do find it interesting that this film had by far the most detailed synopsis on IMDB. Synopsis: Elvira is travelling through the French countryside with her friend Genevieve, searching for the lost tomb of a medieval murderess and possible vampire, Countess Wandessa. They find a likely site in the castle of Waldemar Daninsky, who invites the women to stay as long as they like. As Waldemar shows Elvira the tomb that supposedly houses the countess, she accidentally causes the vampire to come back to life, hungrier than ever. Daninsky has a hidden secret of his own, but will it be enough to save the two girls from becoming Wandessa’s next victims? Why you should vote for it: Because it says right there on the poster, “See it with someone you hate.” This is my chance to invite Channing Tatum over and watch a flick together. There you go, guys. Cast your vote, and whoever is in the lead come Monday morning will be the movie I watch for the first Crappy Movie Roulette! On Halloween night, Emma (Leslie Bibb) and Henry (Tahmoh Penikett) return home after a party. Despite Henry’s objections, Emma blows out the candle in their Jack O’Lantern and begins taking down their decorations, even as kids on the street continue trick-or-treating. Something leaps out at her, covered in a sheet, and slashes her throat open with a pumpkin-shaped lollipop sharpened into a blade. Henry comes outside later to find her head severed and limbs dismembered, dangling from a scarecrow, the lollipop stuffed in her mouth. Earlier that evening, elsewhere in town, the streets of Warren Valley, Ohio are loaded with partiers and revelers – this is a town that takes Halloween seriously. But not everyone is ready yet. Laurie (Anna Paquin) and her friends are at the local costume shop, trying to find last-minute outfits. Laurie is reluctant to join the fun, but her sister Danielle (Lauren Lee Smith) insists. Laurie selects a Red Riding Hood costume. As they check out, Danielle invites the sales clerk to join them at a party they’re going to in the woods. After the others chide Laurie for being a virgin at 22, Laurie abandons her friends, saying she’ll meet them at the party later. She’s decided she wants to find “her guy” herself. Elsewhere, a young boy named Charlie (Brett Kelly) marches down a street, knocking over pumpkins as he goes. He approaches the home of his school principal, Mr. Wilkins (Dylan Baker), who catches him stealing candy. As he carves a new Jack O’Lantern, he gives Charlie a lecture about respecting the dead and the traditions of the past no one cares about anymore. Charlie begin throwing up blood. Wilkins gleefully confesses that he poisoned the candy, and Charlie dies. He takes the body into the house, but is interrupted by trick-or-treaters. As he gives them candy, one of the kids asks if they could have his Jack O’Lantern for a scavenger hunt. He drags Charlie to his backyard, dumping the body into a hole where another body already waits. While working, his son Billy (Connor Christopher Levins) loudly yells for him from the window. His next interruption is the neighbor’s dog, which he distracts by throwing one of Charlie’s fingers to him… but his neighbor Mr. Kreeg (Brian Cox) comes out. As Wilkins hides in the grave, the second body squeals, not quite dead. He gives Kreeg a story about his septic tank being backed up, sending him back inside. Billy pops out again, begging to go with Wilkins to the Halloween party, but Wilkins says he can’t, he has a date. He finally manages to get the bodies buried. When he walks inside, Kreeg shrieks at him from the window, but Wilkins ignores him, and we see someone attack Kreeg. Inside, Wilkins and Billy sit down to carve their Jack O’Lantern… Charlie’s severed head. Billy sweetly tells his daddy to help him with the eyes. The trick-or-treaters who took Wilkins’s pumpkin meet up with some other friends who’ve been gathering pumpkins. Macy (Britt McKillip) says they need more, so they visit “idiot savant” Rhonda (Samm Todd), who has carved dozens. Schrader (Jean-Luc Bilodeau) charms Rhonda into joining them. They make their way to a quarry where, according to the legend Macy tells them, 30 years ago a school bus full of mentally challenged students were taken instead. The children’s parents – exhausted and embarrassed– asked him to do “the unthinkable.” As he passes out candy and checks the chains on the students, one of them gets free and starts the bus, sending it into the lake at the bottom of the quarry. Only the driver survivs, and no one knows what happened to him. Finishing the story, Macy says they’re going to leave the Jack O’Lanterns by the lake. They manage to activate the old quarry elevator, taking Macy, Schrader and Sara (Isabelle Deluce) to the bottom. Macy says she’ll send the elevator back up for Rhonda and Chip (Alberto Ghisi). Back at the Halloween party, a hooded figure in black kisses a girl in an alley. He bites her with a pair of fangs, drinking her blood. She flees into the streets, running into Emma and Henry and begging for help, but they think she’s just drunk. The hooded man returns, finishing her off. Laurie, meanwhile, is having no luck finding a suitable single man – until she sees the man in the hood. At the quarry, Rhonda hears a howling in the distance and declares it to be werewolves. She and Chip take the elevator down, hearing their friends shouting for help as they come down. When they reach the bottom, the others are nowhere to be found. Rhonda leaves the frightened Chip behind and seeks the others, finding the half-submerged school bus in the lake, along with shredded and bloody remains of the other kids’ costumes. A pair of creatures emerge from the slime, and she runs. She falls into the lake, hitting her head, and the attackers reveal themselves to be Schrader, Macy and Sara – the whole thing was a cruel prank. Schrader tries to apologize, but Macy seems more irritated that their trick is over. Packing up, Macy kicks the last lit Jack O’Lantern into the lake, and voices begin to come from the water. The children from the bus crawl from the lake, pursuing the pranksters. They get back to the elevator, where Rhonda sits with her Jack O’Lanterns. The dead children approach, and Rhonda turns the elevator on, leaving her tormentors behind, screaming. Laurie walks through the woods to her party alone, afraid she’s being pursued, until she encounters the hooded man. Danielle, at the party, is nervous for the sister her mother always called “the runt of the litter.” As she waits, a body in a Red Riding Hood cloak falls from the trees. Danielle lifts the cape to reveal the hooded man, begging for help. Laurie suddenly steps out of the trees, casually, albeit with a little blood on her. Danielle admonishes her for being late, and one of the other girls, Maria (Rochelle Aytes) removes fake fangs from the Hooded Man’s mouth. She removes his mask to reveal Principal Wilkins. She smiles, saying she’s glad he’ll be Laurie’s first. Laurie admits to Danielle that she’s nervous, and her big sister tells her to just be herself. She walks to Wilkins, sits on his chest, and transforms into a werewolf, opening her mouth wide for her first kill. Earlier (again), a group of trick-or-treaters visits Mr. Kreeg’s house. He scares them off, taking the candy they left behind, and desperately tries to find something on television that isn’t about Halloween. He’s alerted to an intruder when his gate begins creaking, and someone begins pelting his window with eggs. He steps into the backyard, where his dog is nibbling on something and, over his fence, his neighbor is digging a hole. While they chtalkat, someone watches him from the bushes. Kreeg sees a figure running through his house – a small child in orange pajamas with a burlap sack for a mask (Quinn Lord). (“Sam,” as he’s called, has turned up several times throughout the film, watching our stories.) Kreeg goes to his bedroom, where a burning pumpkin reveals “Trick or Treat, give me something good to eat” written on the walls and ceiling, over and over again, in blood. Sam slashes his ankle with a knife hidden in a candy bar. Kreeg runs for help, slipping on candy and broken glass that sends him tumbling down the stairs. He goes to the window and begs Wilkins for help, but his neighbor ignores him and Sam leaps again. Kreeg rips off Sam’s mask, revealing a horrible pumpkin-like head. Sam finally gets the upper hand on Kreeg, approaching him with a sharpened pumpkin lollipop… but instead of stabbing him, he takes the candy Kreeg stole earlier. As Sam leaves, we see in Kreeg’s fire a burning photograph… years before, when he was a bus driver, at a home for mentally challenged children. Later that night Kreeg, wounded and heavily bandaged, gives candy to a group of trick-or-treaters who come to his door. As he looks around the street he sees Billy Wilkins, bloody, handing out candy, Rhonda coming home with a wagon of pumpkins, Laurie and her friends driving by and giggling… and Sam, on the sidewalk, watching him. Across the street, Emma and Henry arrive at home, Henry admonishing her not to blow out the candle in their pumpkin. When she does it anyway, Sam looks down at his sharpened lollipop and walks towards their home. Kreeg drags himself back inside, but there’s one last knock on the door. The dead children from the quarry are back… and they want their candy. Thoughts: Trick ‘r Treat is one of those movies that sat on a shelf for a few years, scoring only a limited theatrical release before coming to DVD. As such, many people dismissed it – straight-to-DVD movies have a rather negative reputation, you may have heard. But when I finally got a chance to watch the movie I realized that, not only was this a cut above most DVD-first fare, it was actually one of the best horror movies I’ve seen in a very long time. Writer/director Michael Dougherty’s film puts its inspiration on display in the opening credits, which are structured to resemble old-fashioned horror comics of the Tales From the Crypt variety (inspiration for the TV show and movies, the Creepshow series, and countless other contemporary horrormeisters). He displays his four tales (and pieces of others) as part of a single night of insane terror across a little town, connecting them in subtle ways and using the audience’s own expectations of horror movies against it. The effect is a movie that makes you chuckle, jump, and scream, all the while giving you a brand-new horror icon that really could stand right up there with the Freddies and Jasons of the world. The movie isn’t quite a gag-laden comedy the way a lot of the other movies in this project have been. In fact, someone unfamiliar with horror movie tropes may not find much to laugh about at all. The laughter almost always comes in when you realize the direction the story is going is not at all what you expected. In the principal’s story, for instance, Dougherty shows us early that Wilkins has no qualms about murdering a child, and when he begins showing clear frustration at Billy, we’re certain that either Billy will die or Wilkins will get some sort of cosmic comeuppance at the hands of his son. In virtually any other horror movie, in fact, that’s exactly what would happen. The end of the scene, where they tenderly begin to carve Charlie’s mutilated head up together, works brilliantly against everything a normal horror movie does, while delivering a powerful kick to close off that story (for the moment, at least). Even more brilliant, perhaps, is the twist at the end of Laurie’s story. Dougherty sets her up perfectly as the sweet, innocent, virginal “survivor girl,” even making it seem as though she’s going to be pitted against a vampire for her grand moment of triumph. He nails us with two reversals here – first, making her the killer instead of the victim, and second, pulling a werewolf out of nowhere to close it off. Well… almost nowhere. Rhonda, earlier, did claim she heard werewolves in the woods, something that is easy to blow off the first time you watch the movie but that seems like a brilliant bit of foreshadowing on the second viewing. Those little connected moments, by the way, also work brilliantly to make this a strong, cohesive film. Each of the four main stories could be chopped out of the anthology and shown as individual short films, and each would feel more or less complete. The connections, though, make things a lot more fun and help us connect the characters to one another and keep track, mentally, of the timeline. The movie doesn’t jump around quite as much as, say, Pulp Fiction, but it does jump. The good thing is that the nonlinear nature of the story helps with the playfulness of the plot. When Sam kills Emma at the beginning, it seems sort of random. Okay, so she didn’t like Halloween, but surely that isn’t enough to deserve a death sentence. The callous way Henry blows off the girl who died at the party – which happened earlier but which we see later – helps bring things around to Emma getting what (in a twisted scary movie sort of way) she had coming to her. Mr. Kreeg’s story also benefits tremendously from this technique. Chronologically speaking, Sam attacks him long before we hear the story at the quarry, but had the film been shown in that order, the burning photograph would have been meaningless. We would have picked up the meaning later, but it would have robbed the story at the quarry of much of the impact. What’s more, when the dead children drag themselves out of the lake, it’s the first time the movie shows anything that’s explicitly supernatural. Rearranging the story would undercut that, and lord only knows what it would do the werewolf story. Dougherty and producer Bryan Singer have been working for a few years to get a sequel to this film made. Although progress is slow, unlike the perpetually-stalled Behind the Mask sequel, it seems like this one will make it to the screen sooner or later – the movie is not only critically acclaimed, but eventually achieved solid commercial success on DVD. The FearNet TV channel has also embraced the film, having Dougherty direct several holiday shorts starring Sam and showing the film for 24 hours on Halloween, mimicking the success of A Christmas Story on TBS. In fact, if you’ve never watched this movie and you get the FearNet network, there’s the perfect chance to rectify this egregious error. Just check out the various shorts on YouTube, then set the DVR or carve out any two-hour block on Halloween night, and prepare to discover a movie that has become a tradition for horror fans everywhere. Plot: American college students David Kessler (David Naughton) and Jack Goodman (Griffin Dunne) are backpacking across Europe, beginning in northern England with plans to work their way south to Italy. The plans are shattered, though, when they stop at a small-town pub called the Slaughtered Lamb in the town of East Proctor. The locals distrust them, and Jack distrusts the five-pointed star painted on the wall. They leave, disturbing the barmaid and prompting warnings to stay on the road and beware the moon. The Americans are attacked by a huge wolf, which kills Jack and bites David before the villagers arrive and shoot it down. As he passes out, David sees that the beast has turned into a man. He wakes up in a hospital in London three weeks later, where the police take his statement, but believe he was attacked by a lunatic rather than an animal. One of the Nurses, Alex Price (Jenny Agutter) takes a personal interest in him, convincing him to eat even when he isn’t hungry, keeping him company at night. He begins having dreams of running through the woods, naked, slaughtering and eating animals, then later seeing himself in a hospital bed, threatening Alex. After a particularly bad dream, Jack appears in his room, chatting jovially with his friend despite the fact that he’s a mutilated corpse. As David struggles to figure out if he’s dreaming, Jack starts quipping about his own funeral, putting him at ease before he can drop the bomb on his buddy. They were attacked by a werewolf, and since he was killed by a supernatural being Jack is cursed to walk the earth until the werewolf’s bloodline is severed. David, bitten by the wolf, is now part of that line, and Jack begs him to kill himself so they can both find peace. Jenny comes into his room, thinking him waking up from another nightmare, and he kisses her and declares himself a werewolf. When David is discharged, Jenny invites him to stay with her, and their relationship progresses quickly. Despite his newfound happiness, Jack’s corpse continues to haunt David, again begging him to kill himself before tomorrow’s full moon. David’s doctor, Dr. Hirsch (John Woodvine) drives to the town where David was attacked, trying to figure out why David’s version of events differs so greatly from the official report. He finds himself blocked by the same villagers who turned out David and Jack, but this time, one is willing to talk. He warns Hirsch that David is in danger, and will “change” with the full moon. That night, as Jenny works a late shift at the hospital, the predictions come true – David undergoes a terrifying change from man to monster. He rushes into the night and attacks people, as the previous werewolf attacked him. Hirsch returns to London and compares notes with Jenny. Convinced that something is wrong in East Proctor – and wrong with David by extension – he calls her apartment. When David doesn’t answer, he calls the police. The next day, David wakes up in the zoo, naked, in a wolf pen. With some quick thinking, he covers up and gets away. Hirsch, meanwhile, finds the morning paper full of stories about a brutal series of murders where the victims were half-eaten. When David returns to Alex’s apartment, particularly excitable and enthusiastic, she plans to take him back to the hospital. Along the way, the cab driver tells them about the murders, and David flees, planning to turn himself into the police, but the officer dismisses him. He runs away and Alex, Hirsch and the police who investigated his attack begin searching for him. David calls his family in America, hurriedly telling his sister he loves her before attempting to slit his wrists. Finding himself unable to do so, Jack’s corpse appears again, leading David into an adult ovie theater. The corpse, now more decrepit than ever, introduces David to the people he killed the night before, now trapped as a living dead just like Jack. He’s still in the theater when night falls again, and the killing begins again. The wolf escapes into the London streets, going on a bloody rampage, killing some and causing traffic crashes that kill many more. The police corner it in an alley and Alex rushes to the scene, approaching it and trying to draw the real David out. It lunges at her and the police open fire. The beast turns back into David as it dies, and Alex weeps. Thoughts: Reportedly, director John Landis wrote the first draft of this script in 1969 and fought for over a decade to get it released, as studios thought it was too funny to market as a comedy and too scary to market as a horror film. You’ll excuse me if I find that just precious – as the whole point of my project is that the two both can, and have worked hand in hand for decades. On the other hand, the fact that I’ve located so few great horror/comedies before 1980 to include in this project seems to indicate that it wasn’t always the relatively easy sell it is today, and I have to suspect the success of An American Werewolf in London is one of the things that helped turn the tide and convince filmmakers that the conflicting styles could, and do, work together. Landis is clearly a fan of the old Lon Chaney Jr. Wolfman pictures, even throwing out several references to them throughout film. He goes much farther than Universal could in the 40s, though, showing extremes of violence that wouldn’t have been allowed at the time. His special effects are, as to be expected, considerably more advanced as well. The transformation scenes are very good – simply done, but effective. Not to harp on it, but there’s no way this movie would be made today without giving in to the temptation to do the entire transformation via CGI (see the 2010 remake of The Wolfman if you don’t believe me), and that would really kill one of the most memorable sequences in this film. Naughton’s performance during the transformation is really excellent – even before any of the special effects show up he’s putting on a terrific, very convincing show of agony that makes you receptive when the limbs and face start to transform and the hair begins to sprout. But the truly innovative thing about the movie, to me, is the tone of the film. This takes us back to a Type A picture, and an extreme Type A at that, far more horror than comedy. Landis basically wrote a monster movie, a modernized retelling of the Lon Chaney Jr. picture, and laced it with just enough humor and off-the-cuff commentary to market it partially as a comedy. Most of the humor actually comes through Jack – a snarky type even when he’s alive, but he becomes the master of the deadpan quip after he dies. David gets a little bit of physical comedy later, once he transforms for the first time. The sequence where he tries to sneak out of the zoo naked, stealing bits and pieces of cover-up along the way, feels like it could have fallen out of an old Marx Brothers or Hope and Crosby routine. Landis is great at pulling an emotional reversal as well. When David calls home and tells his sister he loves her, there’s a horrible sense of finality to it. It’s a very genuine moment, where you understand you’re listening to a man who’s planning to die, trying to get everything straight before it happens. Considering that David was dancing around in a red fur-trimmed coat just minutes before, the viewer is left completely unprepared. The pace of the film as a whole is surprising, in fact. There’s a very long build-up to David’s first transformation, and once he realizes he’s responsible for the murders you blink and realize there are only about 20 minutes left in the film. It feels like there should be more, like everything has happened much too fast. When the end finally comes, it’s over in the blink of an eye. BAM-David is shot! Alex cries! Begin credits! There’s no denouement to cling to, no moment to allow your emotions to work themselves out before you feel a bit of a tear turn up for the poor American who became something he never wanted to be, did terrible things he never wanted to do, and died in a way he never would have wanted to die. It was a departure for Animal House director Landis and it’s a bit of a departure for this project, but it’s a good one. Plot: Chick and Wilbur (Abbott and Costello, respectively, although why they even bothered with giving their characters names at this point is beyond me) are employees of a delivery company. They get a nervous phone call from Larry Talbot (Lon Chaney Jr.) in London, asking about a pair of crates being sent to a house of horrors. He tells them that he’s flying to Florida the next day, and they are under no circumstances to deliver the crates until he arrives. The full moon rises in London and Talbot undergoes a startling transformation, becoming a Wolfman. Confused by the growling on the phone, Wilbur hangs up. Moments later, Mr. McDougal (Frank Ferguson) arrives to pick up the crates, which he claims contain the remains of the true Count Dracula and Frankenstein Monster. He tells this to Sandra (Lenore Aubert), Wilbur’s girlfriend, who Chick thinks is far too alluring to be with his bumbling friend. Despite the call from Talbot, McDougal has the proper paperwork, so Chick and Wilbur deliver the crates To McDougal’s House of Horrors. Wilbur is on-edge, surrounded by the creepy contents, but Chick is convinced Dracula and the Monster are just characters from stories. As he leaves Wilbur alone, Dracula (Bela Lugosi, reprising his role for the first time since 1931) rises from his coffin, terrorizes him, and mesmerizes him. With Wilbur entranced, Dracula awakens the Frankenstein Monster (Glenn Strange). McDougal and Chick arrive and argue over where the exhibits are while Wilbur, hysterical, tries to explain what happened, but McDougal has them arrested. Dracula flies to a remote castle where waits Dr. Stevens (Charles Bradstreet) and his assistant… Wilbur’s girlfriend, Sandra. Dracula wants to avoid Frankenstein’s mistake and give the monster a new brain, one so simple and naïve that it will never question his master. Sandra, of course, has just the brain in mind. Talbot finds Wilbur and Chick, just out of jail, and confirms Wilbur’s story. He has been chasing Dracula, but he can’t go to the police for fear of revealing his own secret. As the moon is about to rise, he gives Wilbur the key to his hotel room and begs him to lock him up overnight, not letting him out no matter what he hears inside. Wilbur’s compliance lasts almost 45 whole seconds, before he goes into Talbot’s room to bring him a bag he left behind. In another comedy sequence, Wilbur narrowly avoids being torn to shreds by a Wolfman he never sees. McDougal, furious over Wilbur and Chick’s release from jail, meets insurance investigator Joan Raymond (Jane Randolph), who plans to use her feminine wiles to trick Wilbur into revealing the location of the missing exhibits. She narrowly avoids Sandra, who came by to arrange a meeting with Wilbur for that evening’s masquerade ball. Joan convinces him to take her to the ball as well, and while Wilbur revels in his two dates, Chick tries to figure out what his dumpy friend has that he doesn’t. (As Sandra tells him, “A brain.”) The two go to Talbot’s room, where they find it’s been torn apart. Talbot wakes and tells them about his curse – he was bitten by a werewolf, and transforms whenever the moon was full. As Wilbur saw the monsters, he pleads with him to help him. They don’t believe him, and continue their preparations for the ball. Chick, Wilbur and Joan pick up Sandra for the ball (Wilbur allowing each girl to believe the other is Chick’s date). Sandra finds Joan’s ID card for the insurance agency, while Joan finds Sandra’s copy of Frankenstein’s book on life and death. Each suspicious of the other, they return and meet Sandra’s employer, Dr. Lejos, who Wilbur somehow fails to recognize as Dracula wearing a robe instead of his cape. Lejos insists that Dr. Stevens join them for the party, but Sandra suddenly claims she has a headache and can’t go. She brings Dracula aside and says that Joan and Wilbur’s snooping and Stevens’s inconveniently inquisitive nature are making the operation too dangerous. Angry, he hypnotizes her and bites her, and they go to the ball. At the ball, Chick and Wilbur encounter a fearful Talbot, who is upset by Chick’s wolf-mask. Sandra, now a vampire, tries to bite Wilbur, but he’s saved by Chick and Talbot, seeking the now-missing Joan. As they search, the full moon appears and Talbot transforms. He attacks McDougal, who blames Chick when he sees the wolf-mask. The party goes mad and people flee, with Chick and Wilbur finding a hypnotized Joan with Dracula. He mesmerizes the boys and takes Wilbur and the girls away. Finally convinced, Chick finds Talbot and they go to Dracula’s mansion, where Wilbur’s brain is being prepared for transplant. Talbot and Chick burst in. Talbot is about to free Wilbur, but once again, he transforms, and Frankenstein’s Monster breaks free. The five of them engage in a mansion-encompassing battle of positively Scooby-Doo-ian proportions, until finally the Wolfman seizes Dracula and they plunge off a cliff. The Monster chases Chick and Wilbur to the dock, where Stevens and Joan set him on fire. As they sit in a boat, Wilbur berating Chick for not believing him, a cigarette hovers in the air, and the unmistakable voice of Vincent Price introduces himself… he’s the Invisible Man. Thoughts: This film is, inarguably, the greatest horror-comedy ever made. Okay, maybe it’s not inarguable. You can argue it. You’d just be wrong. What’s not arguable, however, is that it is by far my favorite movie out of all the films selected for Lunatics and Laughter, and (with the possible exception of Ghostbusters) the one that I’ve watched the most times. It isn’t Halloween unless I see Bud and Lou go toe-to-toe with the greatest Universal Monsters. That, in fact, is what makes this such a fantastic movie, friends. 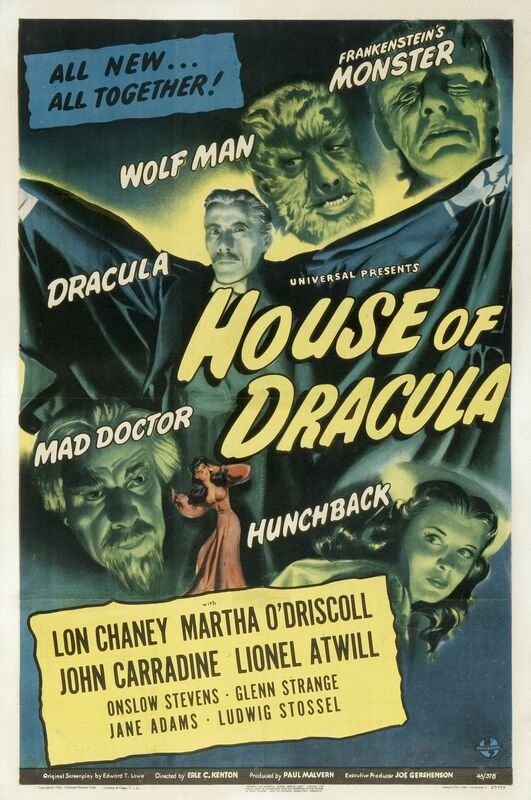 Universal Studios took their two greatest comedic stars at the height of their popularity and mashed them into a movie with three of their most popular monster franchises, even getting the classic Bela Lugosi and Lon Chaney Jr. to reprise their roles as Dracula and the Wolfman, respectively. (Only Boris Karloff as Frankenstein’s monster is missing from the classic trinity, and he would get his chance to dance with the boys later in Abbott and Costello Meet the Killer, Boris Karloff and again in Abbott and Costello Meet Dr. Jekyll and Mr. Hyde). It’s such simple alchemy – director Charles Barton got five amazing performers and allowed them to do what they do best for 83 incredible minutes. Abbott and Costello pull off the same sort of brilliant wordplay and slapstick that made them Hollywood legends, while Lugosi, Chaney and Strange (playing the Monster for the third time since Karloff’s retirement) give their performances all the force and horror they had in their respective series. The film doesn’t bother with little things like continuity either – there’s no effort to explain how Talbot knew Dracula or the monster, how Dracula found the creature’s remains, or even how any of the monsters were alive, as most of them had a tendency to die at the ends of all of their films. The sequels usually had a halfhearted resurrection scene, but Barton sees no need to even bother with that. The audience doesn’t care about any of these things. They know who Bud and Lou are, who Dracula and the Wolfman and the Monster are, and that’s all they need. And damned if they weren’t right. Like I’ve said, comedy and horror are flip sides of the same coin, and I’ve never seen a movie that demonstrates it as perfectly as this one. Our five lead characters (because that’s who Bud and Lou are, no matter what names they were using in the movie, they played the same two characters they always did) come from totally different styles of film: slapstick comedy and tales of pure terror. But when we put them together there is no clash. Everybody is themselves, everyone is entirely in-character, and it all fits together seamlessly. Even the scenes with Lugosi popping in and out of his coffin, giving Costello the stimuli for one of his legendary freak-outs, works for a Dracula who simply enjoys toying with his eventual prey. He even pulls the same sort of hypnosis and gets the same light-across-the-eyes treatment as he did in the original 1931 version of Dracula. The plot, meanwhile, is straight out of the horror movie handbook. Dracula’s scheme to give the monster a simple brain keys into Costello’s movie persona perfectly. At the same time, it’s still the kind of devilish plan that many a horror movie villain has concocted over the years. Hell, let’s be honest – it’s a more logical plan than thousands of the others movie monster baddies have conjured up over the years. Talbot’s logic – “the police won’t believe me unless I tell them I’m a wolfman” – is kind of sketchy. It’s more likely they’ll just think him even crazier. But it’s still the same sort of logic that dominated this sort of movie back in the 40s and 50s, and therefore is easy to forgive. Similarly, the special effects are of the highest quality available at the time. Talbot’s werewolf transformation looks as good as it ever did in his own films. And while it may be pretty obvious that the Monster burning on the dock at the end is a mannequin being pushed along with sticks, in 1948, how else were you gonna get that shot? Even the old comedy trope – the panicky one sees the madness, the straight man conveniently misses everything until the last minute – feels fresh and original here. And no, it wasn’t, not even in 1948. When Chick pulls out the wolf-mask, you just know there’s going to be a moment when Wilbur encounters the real Wolfman and thinks it’s his buddy in disguise. You’re waiting for it. You would feel disappointed if it didn’t happen. But Abbott and Costello never disappointed on that front. The finale is simply great. From the moment Talbot and Chick arrive at the mansion until Vincent Price makes his uncredited cameo, we go through one chase after another, with doors and props being smashed at every turn, our heroes bumbling into the monsters at the worse possible moments, often saved through circumstance, luck, or the good ol’ Rule of Funny. If you are physically capable of watching this movie without laughing, you need intense psychoanalysis. And if you didn’t love the Universal monsters before, this will do the trick.